I have recently bought an IDJ Landcruiser BJ40 1979, the vehicle is in Gujranwala (my home), previous owner in Lahore and I am in Dubai, someone told me that recently the transfer procedure in ICT E&T office has been changed and both the seller and the buyer need to be present, with finger print verification and once the procedures are completed only a registration card is issued to the new owner. Correct? Is it worth mentioning that the vehicle was obtained from cabinet division auction in Jan 2016, transferred to previous owner's name upon my insistence in August, and token taxes paid upto June 2017? And is it mandatory to take the vehicle to Islamabad? It maybe under a restoration process in a couple of weeks and in no shape for driving it to Islamabad. The seller didn't take it with him for transfer to his name in August 2016. Anyone who can enlighten me about the latest procedure, required documents and number of days a transfer would normally take at Islamabad E&T office? I wish to get this done as soon as possible, and if possible, in my absence. Hi Umair, You can contact Mr. Usman Faisal as he will be able to help you with registration without any hastle. His email is usman.faisal@ppaf.org.pk Email him and he will give you all the details you require for registering your vehicle. Thanks Faheem, I did send him an email to which he responded with his cell phone number. Tried calling him a few times while I was in Pakistan last 2 weeks but couldn't get an answer to the call. Anyways, I just went to the Islamabad E&T Office and somehow managed to get the documents submitted (without any agent's involvement and an effort of running here and there lasting 4 hours). The return date on the receipt is 13-Nov which is Sunday, so I left it with my Uncle to collect it with my Authority letter. Hopefully there won't be any issues and the transfer will be done to my name. A quick update to this. Yes they now want the previous owner to be present for the transfer. 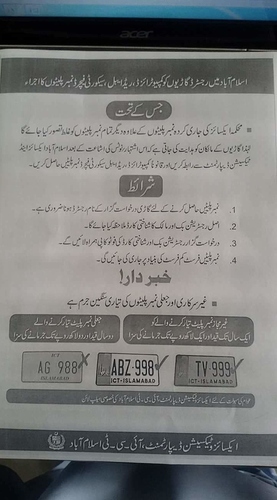 Only the previous owner can obtain the TO Form issued on his name with his CNIC from the E&T office Islamabad. The initial response at the information counter (distributing forms) is always to bring previous owner. After a bit of persuasion you will be guided to discuss with the next window, who again after a bit of persuasion asked me to discuss my case with the E&T Officer in room 6. After attaching an affidavit on a Rs. 20 Stamped Paper and getting my documents attested from a Govt. officer, and a few more formalities going back and forth I was able to get his signatures on my documents to enable me to submit at one of the counters, where I paid the fees and took the receipt. I also came in contact with three agents during this time, all of which were off the E&T office limits due to a recent raid. But I decided to try my luck on my own and with Allah's help I succeeded in submitting the documents. Ok, today I received the documents with vehicle ownership transferred to my name. The thing is if you have the documents, and even if something is missing and you deal with the people at the E&T Office patiently, politely and humbly, and if you ask Allah's help, you do not need any agent. I did not have the previous owner with me, but due to the guidance of the E&T officer and with his understanding of my issue, I was able to submit the documents and get the ownership transferred. My case is reverse where original owner can go but I can't it has to be transferred to my name. I spoke to my friend who has a car show room in Islamabad and is saying I don't have to come he will get it done. How is that possible do you think he is right. Any feedback will be appreciated. Usually transfers in other parts of the country can be done, only your CNIC copy, sellers CNIC copy and the original book and file are required. I got my Civic (Punjab Excise) transferred without a hassle as I knew someone in Excise and he got it done for me. For Islamabad, the procedure seems different. Maybe due to recent security situation they require buyer and seller to be there, as otherwise any body can get any vehicle transferred to anyone else's name and the vehicle can be misused. Again it depends on how well the person you referred is connected with the department. Do update if it gets done. Any car being transferred within 5 years i.e. if the car is less then 5 years old, you would be required to pay witholding tax. Just go to exices department website, the rates are mentioned there. Just a simple quester guys. I need to transfer my vehicle as I am selling it. 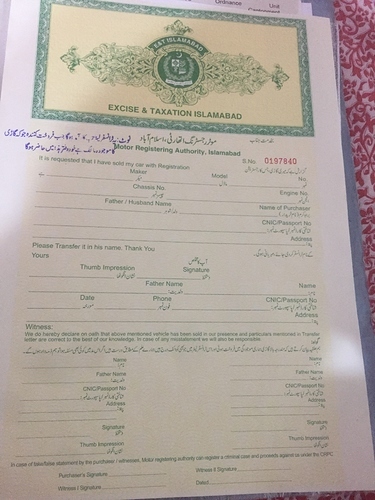 I went to Islamabad ETO office and I told them that I came to Islamabad just to get the transfer letter so that I can sell my vehicle and what should the documents required as I brought the file and registration book with me. They gave me the TO form and told me that just fill it and give it to the buyer as he will need this and file and registration book for transfer of owener ship. Is that correct. The only thing worrying me is the note written that the owner needs to be present at that office. What does that mean. I need to be there at the time of transfer ? I want to transfer ownership of my 10 year old Islamabad no Mehran to my elder brother. My brother ---> the buyer ---> is in Islamabad nowadays. Myself ---> the seller ---> but I am not living in Islamabad. Out of city. Today I went to ISB Excise and Taxation and they have given me a total of 04 different forms. The information desk said its compulsory to bring the OWNER of the car for transfer of ownership. However, I said them he is unavailable. They told me that to get the documents / CNIC attested by a GRADE-17 officer and it will be upto ETO to make the decision. My question is that do I need some kind of affidavit or stamp paper? As the owner is not present, but the buyer will be present. ps: both the seller and buyer are blood relatives. Dear @shoaib.sheikh do as the ETO says and get it done on the same date. I attached an affidavit on Rs. 20 stamped paper, prepared by a stamped paper seller next to HEC office. what do you mean by the same date? what was the text of affidavit ? please elaborate a bit more, will be really glad of you. sir thank you so much. very glad of you. specially for the picture you PM me.